Do you struggle to get everyone together for a shared meal each day? As families, we want and need time to have meaningful conversations, but unless we recognize the ongoing value of those interactions, they seldom happen. How can we make the most of our times together, whether meals, traveling or bedtimes? I’ve found several effective reminders that we as parents can implement to increase the value and frequency of family conversations. It is way too easy to let the “urgents” of schedules and work and weariness push aside the priority of building a cohesive family. When we purpose to set aside all other distractions we are then able to give our attention to one another and truly hear one another. The key is to make meal time or travel time the prime time for sharing with one another on a regular basis. That means putting down or silencing our phones and other distractions! Prioritizing the value of one another with undivided attention speaks volumes to their value to us. Time together as a family, truly hearing one another, is one of the wisest investments we can make in our lifetime. As we carve out time to hear the hearts of our children and spouse, we gain a window into what is truly important to them. We can then choose to come alongside and let our spouse and children know that we are with them through the ups and downs of the day. While earnestly listening, we can ask the Holy Spirit to guide us in how we respond to what they share. Quench the desire to jump in with advice or opinions; this is not a time to manage or problem-solve. Simply hear their heart and mind and world and give them your undivided focus in the moment. Whether it is a short and light conversation or an in-depth one, there is value in time spent eye-to-eye, giving genuine interest that affirms each one. As we slow down to truly hear one another, we see our children grow and change into an adult before our eyes! Don’t minimize the value and potential of these little ones you take care of; rather, value them as the future adult best friends you will ever have! Granted, time constraints hinder having in-depth discussions every night. However, as we work to cultivate this priority of family time, the blessings of deep and rich fellowship will be our precious reward. We actually had our best family conversations - about explaining meanings or context of what they hear around them, world history, current events, how things work, nostalgic music and lots of laughter - around the Saturday breakfast table! No matter when or where your family conversations take place, the key is to intentionally seize the opportunities or make them, and cherish hearing the hearts of those you love. 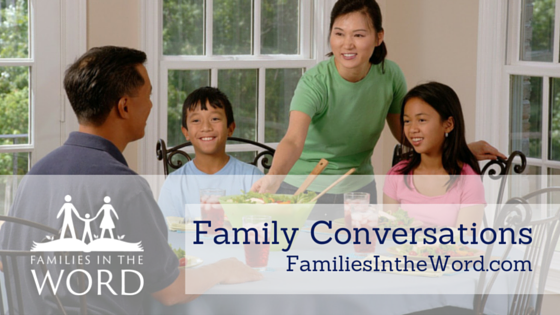 How about you...what are some helps you've found to create great family conversations?